Spirits of Oz, one of the 2014 Community Novel project books at Topeka and Shawnee County (Kans.) Public Library. Traditionally, self-published works have had a reputation for being unedited and poorly designed products, and libraries have not embraced their authors. That dynamic is changing, as libraries like Provincetown (Mass.) Public Library—which curates content and enables authors to distribute their work digitally through Provincetown Public Press—undertake publishing efforts as a way to demonstrate the viability of self-publishing to their customers and communities. Any library can position itself to guide local authors toward becoming savvy and competent independent publishers. Ebooks and print-on-demand options leverage the strength of their platforms to reach larger audiences and make publishing possible within the library. Libraries can support the growth and autonomy of local writers by connecting them to relevant technology, tools, and resources, as well as to one another. After eight years of programs promoting National Novel Writing Month (NaNoWriMo), Topeka and Shawnee County (Kans.) Public Library (TSCPL) responded to customer requests for similar events. Since 2012, the library’s Community Novel Project (CNP) has published four books set in Topeka, with each chapter written by a different author. The novels are serialized weekly on the library’s website, published as free ebooks through Smashwords (a self-publishing platform), and even released as audiobooks. Printed with Createspace, the titles sell on Amazon for about $5.99, the minimum allowable price. In September, 110 copies of two of these books—Spirits of Oz and Superimposed—were preordered. Additional copies are sold in the library’s Booktique. TSCPL sees self-publishing authors as micro-business owners and focuses on increasing their access to resources to publish better products. 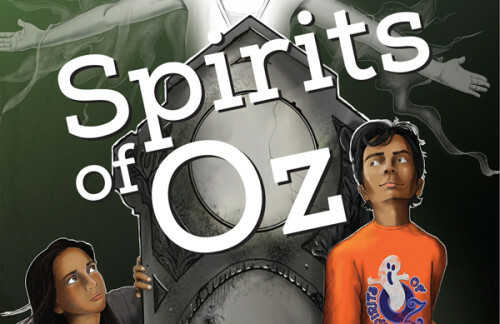 Many contributors, like Spirits of Oz authors Aimee L. Gross and L. J. Williams, are now advancing their own self-publishing plans. “Through participation in library programs, I learned skills needed to successfully self-publish my first novel,” says Gross. 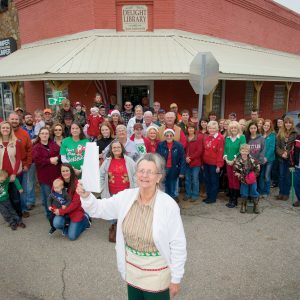 Other programming includes a series of established writers speaking on topics of expertise and an annual holiday book fair and signing, “Great Writers, Right Here,” featuring 80 regional authors. “The fair places indie authors side by side with traditionally published authors, creating a venue where both can be displayed to readers and other writers with equal respect,” says TSCPL public services librarian and fair organizer Miranda Ericsson. Last year’s event included work by self-published author James Young, a NaNoWriMo participant with a growing fan base, alongside traditionally published bestselling authors like Alex Grecian and Harriet Lerner. In July 2014, Daviess County (Ky.) Public Library (DCPL) and Henderson County (Ky.) Public Library (HCPL) launched ePublish or Bust to help self-published authors promote their work in libraries. The website is intended to be a one-stop shop for writers and includes a shared-book calendar. “It says to authors: We are extending open arms to connect you to the readers,” says Jim Blanton, the site’s founder and DCPL director. Participating libraries support authors with programming, advice, and book tour opportunities. To illustrate the self-publishing journey, Blanton blogs about the ongoing process of creating a vampire fiction novel, demonstrating the information and tools needed to go from a great idea to a published product. With a monthly workshop, DCPL provides the tools aspiring authors need to create, publish, and promote their work. Self-published authors like Jennifer Smith, an early adopter of ePublish or Bust at DPLC who wrote a book about her battle with multiple sclerosis, share their experiences at various library events. After a three-month beta-testing period which ended in September, the libraries began adding partners, including Warren County (Ky.) Public Library. Blanton hopes to expand the program beyond Kentucky. Using a Pacific Library Partnership Innovation and Technology Opportunity Grant, Los Gatos (Calif.) Public Library (LGPL) created two self-publishing mobile labs; each includes a MacBook Air, 10 iPads, and a charging cube. Building on an existing partnership with Smashwords and expanding outreach efforts to the local high school, town librarian Henry Bankhead worked with Los Gatos High School teacher Tonya McQuade and 120 freshman students to publish a poetry anthology ebook, Windows to the Teenage Soul. In the classroom, the students divided into teams to emulate the tasks and workflow of a professional publisher, gaining experience and increasing their likelihood of self-publishing in the future. “The most rewarding part for me was when we were the top selling poetry book on iBooks because I was on the marketing team, and this showed we were successful,” says student Ailidh Finlayson. Including preorders, the ebook has sold 106 copies through six retailers—Amazon, Apple, Barnes & Noble, Overdrive, Scribd, and Smashwords. “I can imagine publishing my own book in the future if I put in the time and effort to become a better, more inspiring writer,” says 10th-grader Nitin Srinivasan. “When we did this self-publishing unit with the high school, immediately other people wanted to replicate it,” said Bankhead. Another classroom completed two short-story collections by the end of the school year. LGPL also partnered with Smashwords to create a co-branded a portal on the library website that allows authors to make their work available to a wide audience, including public libraries. Writers who use the portal will have their work tagged as originating from the library, which will consider purchasing titles as part of its ebook collection once they are available through library distributors like Overdrive, 3M, and Baker & Taylor. “Self-published ebooks don’t go out of print, so it makes sense to authors as individual agents,” Bankhead says. “It gives them, as publishers, the ability to go directly to the audience. They can engage directly with the reader without an intermediary,” Bankhead says. LISSA STALEY is a book evangelist and librarian at Topeka and Shawnee County (Kans.) Public Library. She encourages writers through TSCPL’s Community Novel Project and National Novel Writing Month. Email: estaley@tscpl.org.